Besides your clippers, your comb or brush is probably going to be one of the most important tools in your kit. You should comb through your beard just like you comb through your hair in the morning. 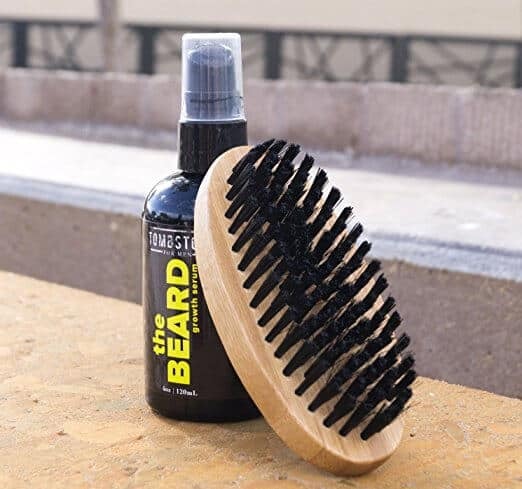 It will fluff out the bottom of your beard, set all of the hairs going in the same direction, and distribute beard oil and other products from the roots to the ends. Once you start using a classic Kent boar brush, you’ll be hooked. And so, if you are on the search for the best beard combs and/or brushes, look no further! In fact, I usually tell new beardees that the first beard tool they should have in their arsenal is their beard comb or brush. If you decide to grow a beard, you’ll be using a brush right from day one. You may not need beard oil until a few weeks in, but you’ll definitely need to start training those hair follicles right away. In this article, we’ll go through the best beard combs, best beard brushes, and combo packs. Then we’ll discuss the benefits of brushing your beard, and some of the differences between a beard brush and a beard comb. Choosing a beard brush or comb is not rocket science, but it is important to keep a few things in mind before you buy. There is a reason that they are made from the material that they are. Namely to make sure you groom your beard without doing any damage. With that in mind, here are some things you need to understand before you buy. To properly detangle your beard without pulling the hairs, you need a wide tooth beard comb. This is especially true if your beard is longer than a couple of inches. A narrow tooth comb will struggle against the beard and you will risk split ends forming by forcing it. Once your beard is detangled with the wide tooth, then you can use a narrow tooth comb to style and shape your beard. If your beard is shorter than 1.5 inches, you can usually just use a narrow tooth comb since a wide tooth won’t accomplish much on a shorter beard. The easiest material to use for a good beard comb is wood. The type doesn’t make too much of a difference, but the higher end ones will usually feature a more deluxe wood like olive or something similar. Just make sure you keep in mind the tooth width as I mentioned in the last section. Wood will be gentle on your beard and not cause any static electricity. A hard vulcanite or cellulose acetate material makes for a good beard comb, but these are more rare than finding wooden ones. These are more than acceptable as they also won’t damage the hair or cause static electricity. Any beard comb made of metal will be durable and has the chance to outlive its wooden or rubber counterparts. Though they won’t damage the hair like a plastic comb, they can cause static electricity. This should be avoided since it will prove difficult to smooth out your beard. Your beard will have a lot of flyaway hairs and look scraggly when you have it charged with static. Unless you are a vegan, bone is a good choice. It acts just like wood where it doesn’t cause any static and won’t snag your hair. What’s the difference between wood and bone, then? It’s more about aesthetics than anything. Bone has a throwback look to it that is attractive for some people. A beard brush is a bit more straightforward than a comb as it doesn’t matter what the handle is made out of. The bristles should be made of boars bristle though as it won’t damage the beard like plastic. It also helps to evenly distribute oil or balm to your beard. There is synthetic boar bristle if you’re concerned about using animal products, but avoid plastic bristles at all costs. If a beard brush is really cheap in price, it probably has plastic bristles. Spend a few dollars more and get one that will last a while and be good for your beard. The Breezelike Sheep Horn Beard Comb is elegant and compact and made from durable, high-quality materials that will last for many years. The plastic combs you find in your local drugstore may only cost a few dollars each, but they’ll destroy your hair. You’re actually better off not combing it at all than combing it with a cheap plastic comb. Not only do they break easily, but the plastic teeth have sharp edges that snag when you pull them through your beard. It’s likely causing more damage to your beard than good. 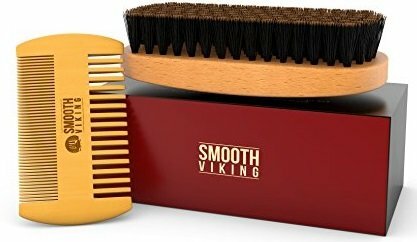 The best beard combs shouldn’t tear through healthy hair! On the other hand, horn is a natural material that reduces static and frizz and glides through your hair easily. Its wide teeth will help to easily fluff up a long beard, and the elegant polish will look perfect on any vanity. It’s also small enough to fit easily inside a briefcase or snug inside a pocket if you need to carry it around with you. If you need to clean the comb though, be careful not to soak it in hot water. The material will degrade if exposed to water. Instead, wipe it down with a clean cloth then polish it with a bit of olive oil to make it shine. 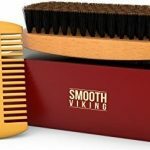 The Smooth Viking Combo kit is the best beard comb and brush set for any men who are looking to grow their beard out but nonetheless like to change up their style from month to month. It’s really a one-size-fits-all kind of kit that’s versatile enough to work for men with beards of all lengths. 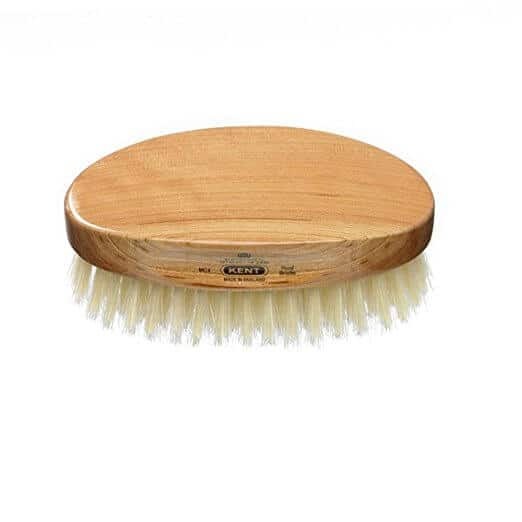 The thick boar’s head bristle brush is perfect for shorter beards. Though it doesn’t have a handle, it’s great for taming curls and calming frizzy morning beards. The wooden handle gives the brush a classy finish, and the natural boar’s hair bristles are shorter and softer than most so they won’t scratch or irritate your chin. 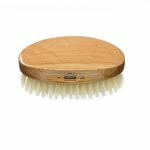 Some customers complained that the bristles fell out, but this is relatively normal with brushes made of natural hair. It also has a funky smell when it comes out of the package that eventually dissipates which is why it made it to our list of the best beard brushes. Once your beard gets long enough, you can switch to the comb. The comb is double-sided, so you can comb through your mustache with one side and your beard with another. It can also accommodate men with hair of different textures. If you have thick hair, you can use one side, thin hair the other. The Grow a Beard combo set is the best comb and brush combo for men with dry hair because the bristles of the brush are thick and absorbent. 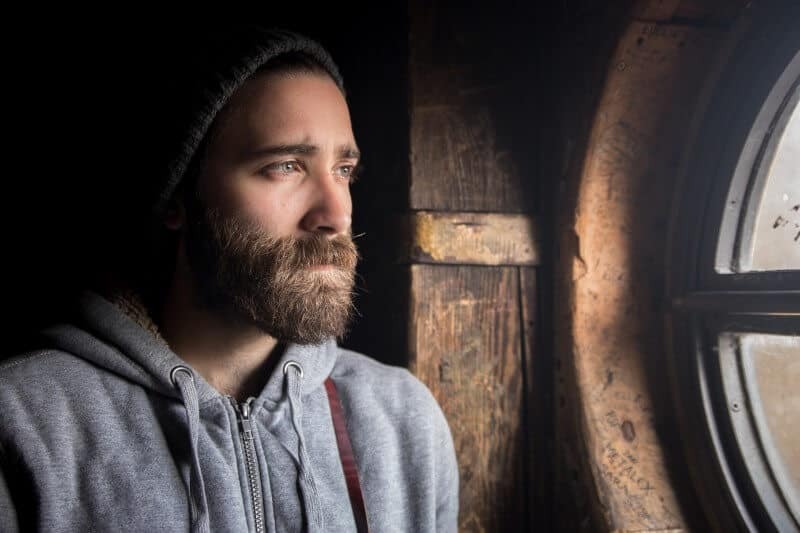 If you’ve been growing your beard for at least 6-7 weeks, the hair is probably about 3/4 of an inch long by now–just long enough to start getting a bit dry and itchy. Your hair does produce natural oils, but once your hair starts getting long, the oils won’t get to the end of the follicle. At this stage in your beard-growing, you’ve probably started using a beard oil, but it won’t help you if you don’t distribute it properly. The boar’s bristles in this excellent brush help you spread the beard oil throughout your beard by absorbing a bit of the oil as you brush across your chin. This set of the best beard combs that made it to our is made from bamboo. While some customers complained that the handle felt a bit fragile, bamboo is sturdy and hygienic. Wood easily absorbs bacteria, and even if you wash the brush, it may still hold onto some of the oils and balms. Bamboo is far cleaner. The beard brush is perfect for training your beard. Beard hairs, unfortunately, don’t always grow in the same direction. By rubbing the bristles back and forth against your chin, you prevent the hairs from growing solely in one direction. If you start training your beard right from the start, it’ll be much easier to groom it once it gets longer. Lastly, this best beard combs and brushes kit comes in a handy gift box, so it’s perfect for Father’s Day, anniversaries, and birthdays. 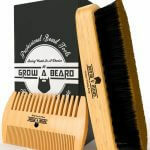 Check Out Grow A Beard on Amazon.com! 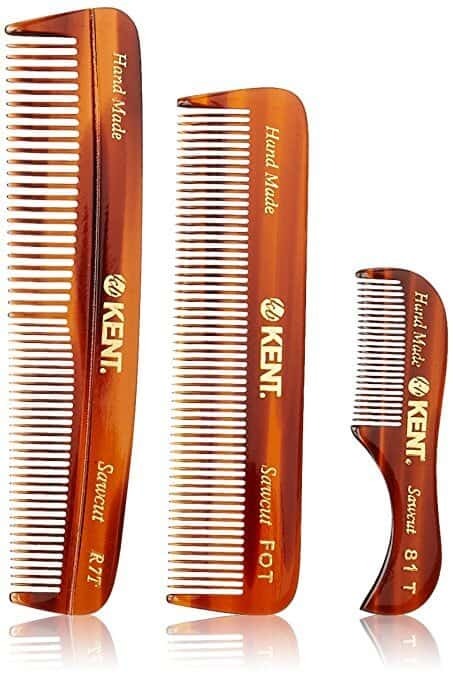 Kent makes, without a doubt, the best beard combs and brushes around. They are hand-crafted with the highest quality materials you can buy, and the craftsmanship shows. G B Kent & Sons Ltd is a British company that has been producing brushes and combs since 1777. Established by William Kent , the company has grown into one of the most well-known producers of luxury combs and best beard brushes for both men and women. The business passed from father to son for six generations until the last of the Kent boys passed away and the Cosby family took over management. The brush is made from wood and white boar’s hair. Though it takes a little while to break in the brush, the bristles are particularly soft against the skin. As opposed to other boar bristle brushes, the hair rarely falls out, and while the brush is expensive, it can last you 30+ years. 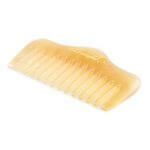 While the comb looks like it’s made of plastic, it’s actually made of cellulose acetate, a polymer originally used as a film base in photography. It’s beautiful sheen and satiny texture make it a far more attractive choice than plastic, and because it’s hand-polished, it won’t snag as you drag it through your beard. Do note, though, that the best beard brushes photos on Amazon are not entirely accurate. Both the combs and brushes are smaller than they appear in the photos. Because they’re so small though, they’re ideal for travel. Check Out Kent Combs on Amazon.com! 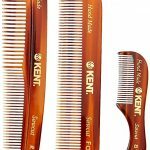 Check Out Kent Brushes on Amazon.com! The best beard brushes you find available on Amazon are made with boar bristles. Boar’s hair naturally conditions hair and improves its texture, so it’s ideal in terms of quality. However, you cannot get boar’s hair without killing the animal. Horse hair is obtained from the tail and mane, so cutting it won’t hurt the animal. So, these brushes are not exactly vegan-friendly. You could always buy one of the best beard combs. Since most are made from either wood or cellulose acetate, you wouldn’t have a problem. However, if you have a short beard, chances are you’d prefer one of the best beard brushes, and steer away from the best beard combs. This Tombstone beard brush is cruelty-free. It was never tested on animals, and the bristles are entirely synthetic. Though it’s not as full and thick as many of the boar’s hair brushes, the bristles are considerably softer against the face. With Tombstone bristles, you can groom your beard knowing in full confidence that animals were never harmed or killed in the process of making the brush. Check Out Tombstone Brushes on Amazon.com! Why Comb Out Your Beard? If you want to groom your beard properly, you need to comb or brush it. People have been using hair brushes and combs for thousands of years. There are even pictures of the Romans and Greeks braiding and styling their hair elaborately with brushes and combs. So, what’s the big deal? Here’s why you should start using the best beard combs or brush right away: 1. Improve Volume & Thickness- By combing through your beard a few times, you can improve its volume. A few strokes underneath can make even thin hair look fuller and healthier. The best beard combs though are made out of wood or horn. These will fluff up a beard without tearing through it. 2. Increase Beard Growth- Brushing over the hair on your cheeks increases blood flow to your face therefore stimulating the hair follicles. There’s reason to believe that simply brushing with the best beard brushes can help it grow faster. 3. Distribute Beard Oil- Beard oil is a beardsman’s best friend, but it won’t be of any use to you though if you don’t distribute the oil throughout the beard. A beard comb or brush can help you spread the oil from the root of the hair to its end. 4. Train Young Beards- It’s fairly common to find beard hair growing in two different directions. Brushing your beard with the best beard combs regularly from when you first start growing it out will help train it to grow in properly. Just don’t forget to clean your brushes regularly. Boar’s hair bristles will absorb the oils and balms you use on your hair, and they’ll build up if you don’t clean out the bristles. Synthetic hair is somewhat more sanitary and easier to clean out, but regardless of what tool you’re using, you need to make sure you’re taking care of them properly. Which Do You Think Is the Best Beard Comb & Brush? Have you used any of these best beard combs on our list? Which one will fit your lifestyle? 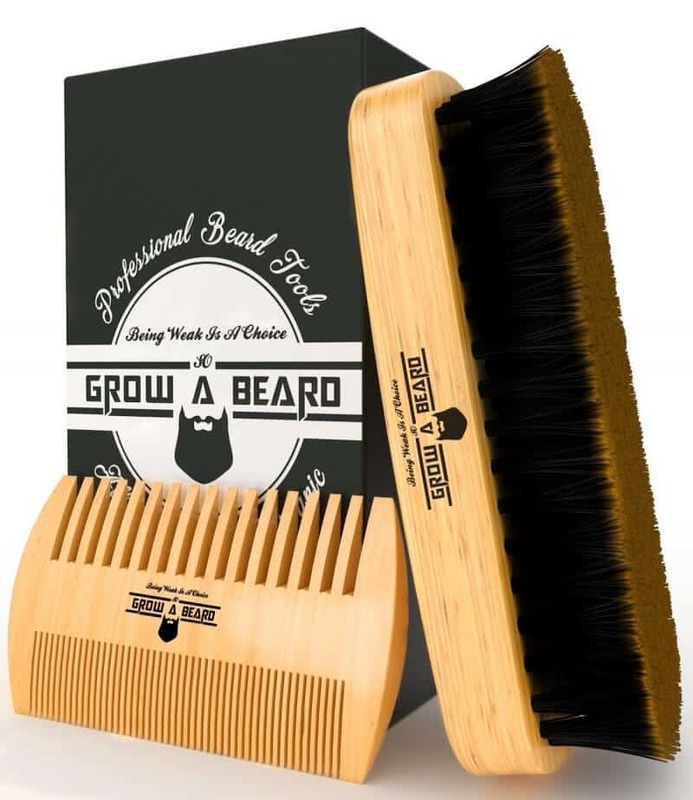 We want to know which one you think is the best beard comb and brush/ combo kit. Give your comments below.